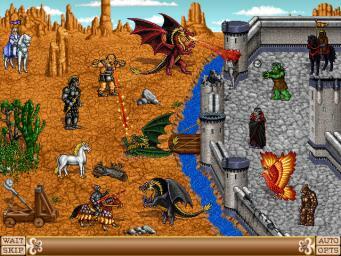 It's time to set up a major discussion about HoMM2 gameplay mechanics. 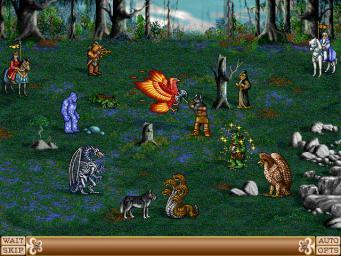 According to the HoMM2 Museum thread, some promo screenshots of HoMM2 demonstrate a peculiar battle interface featuring the WAIT button. But did it really exist? Yes, it did! According to the in-game data, there was no such graphics (obviously, cut out), but the code still contains some lines making it possible. The Wait function can be restored with AlexSpl's Patch (first link in the list), where you can activate it by pressing the "W" key on the keyboard. 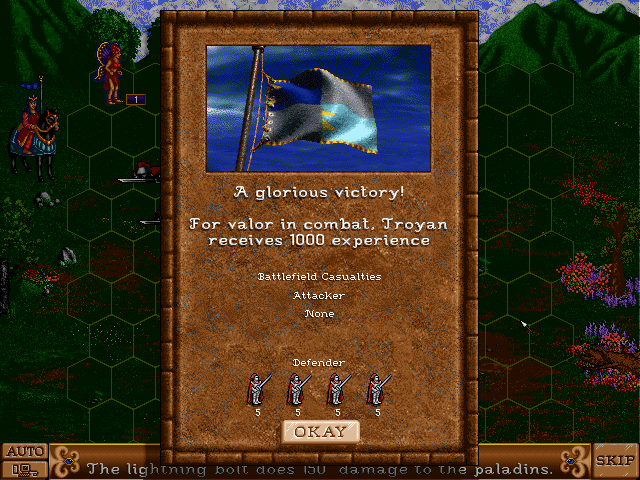 However, the AI doesn't know how to use it, so that it makes sense only in multiplayer, where the human players may create complex strategies on the battlefield. 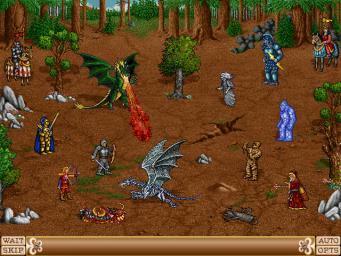 The question is: Would you be interested to play HoMM2 with this "new" feature? Yes I would, but only if the AI can use it properly too. Yes, it is intended that the AI is capable of using the feature. I think the Wait button is a good idea because it's a fairly simple mechanic that adds a lot of tactical depth, lets the player feel more in control, and removes the feeling of players feeling bad for having what is mostly a good thing. To have it on by default in Ironfist, we'd have to make the decision to fully embrace having existing maps play differently (and probably incorporate lots of balance changes while we're at it). If you add the range penalty I think you should also add the wait button, otherwise it's sometimes better to have slow shooters than quick ones, that doesn't make sense. If there's a possibilty to choose between the H2 & H3 battle system before you start a new game that would be very awesome! Why should anyone add range penalty in Heroes 2? I think it's more than pointless with its battlefield size. It already exists during the siege, though. Anyways, with H3SW's classic battle system being H3 battles, I think having PI with classic H2 combat + WAIT will be ultimately awesome. How would you decide which maps are "classic maps"? After all, there were a lot of high quality user-made maps do that might need wait to be off. Are Ironfist maps a different format to regular .mp2 or .mx2 maps? If so it could just set the wait option based on the format. Ironfist maps are the same format as classic maps currently. That will probably change at some point, just as we've changed the savegame format. That would be a nice addition. Still, there are some requests, like the ability to restrict certain types of factions (for random choice), especially the Cyborg, some alliance tweaks and so on. And the ability to convert classic maps to Ironfist format, of course. The Wait feature may be functional only on Ironfist maps. Don't know if it's doable. I voted for "no" ;P I like a lot tactical feeling which "wait" button gives in H3, but it is very often overused, especially when we're playing with AI. In H2 it's also case of a smaller battlefield - creatures can reach the opposite site quicker and because of it waiting is less useful. 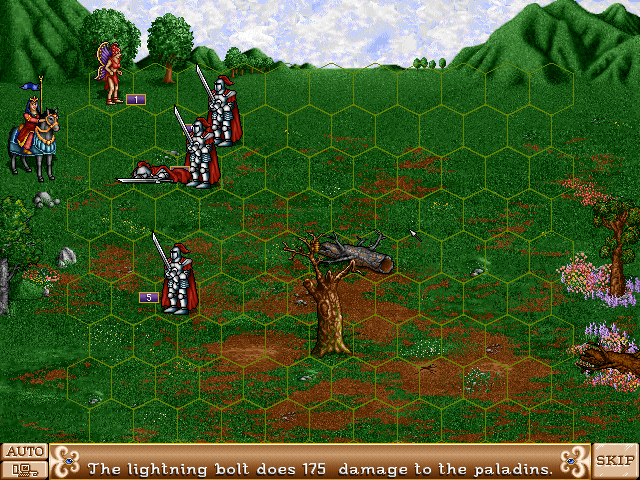 Moreover the longer fight lasts, the bigger is chance of loosing more troops - archers have no penalties for distance and even week wizard can cast lightning bolts one by one killing our best creatures. I would be very glad to know what exactly moved NWC to resign from this idea. creatures can reach the opposite site quicker and because of it waiting is less useful. But this is the ultimate advantage. In H3 Wait was used in 95% of situations which made combat boring and working on the same damn scheme. In H2 Wait will be available to use in different situations, and sometimes using it will be a bad choice, which makes this feature perfect for tactics. Moreover the longer fight lasts, the bigger is chance of loosing more troops - archers have no penalties for distance and even week wizard can cast lightning bolts one by one killing our best creatures. But no one stops you from not using Wait with your ground troops and move them like they are Nothing is changed in this case, and that wizard could cast the same lightning bolts without the Wait feature as well. It's on player's decision if he/she wants to wait or try to rush to the shooters. I am not against, provided that the AI can use it properly, but I also want to be able to play without it (the good old way, so the AI don't uses it (it's easy to the player to just ignore the Wait button)). So, I vote for "Yes if it's an option", the player must have the choice. If yes you must give it AI too! Not only human players. If AI cant understand it that will be only cheat. AI included - that's what it says in the third post in this thread. When I am playing H3, most of the battles with neutrals look like cheating ;P Slow/Speed and running over the battlefiled up and down . H2 looks a bit more balanced in this case though. Mass speed/ slow spells are hard to reach and battlefield is much smaller. But I am sure that "wait" would lead to abuses once again. Very interesting video. I have some points though. From what I see this situation could be in H2 as well also without the wait option. It would actually say it is even easier in H2 for a couple of reasons. 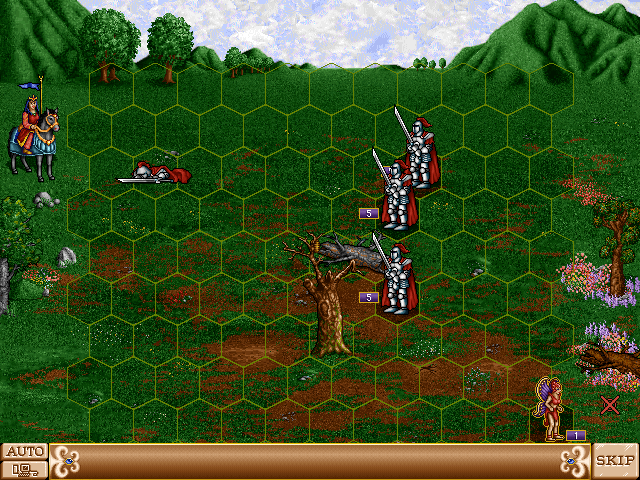 First, flying units doesn't need to have haste cast on them to reach to other side of the battlefield. Secondly, nuetral stacks always have neutral morale which means they cannot get an extra turn which can break the creeping tactics and thrid the number of neutral stacks is only 5 compared to 7 in H3, although you could say that makes up for it with a larger battlefield. My point is that it is not the wait option that makes this possible. It is things like having powerful spells as haste and slow at such an early level (not to forget the crazy power of mass haste/slow you can get in H3). I would think that the wait option would be a nice addition to H2 so that you wouldn't have to skip the turn of your fastest unit, because you would wait for the enemy to make the first move. I miss that possibility in H2. Btw. tried with simmilar situation in H2 and it work out pretty smooth. Occasionally neutrals can get morale in H2, if it is base creature that has an upgrade, and the upgrade is included in the fight. The difference in that respect is that H3 gives a morale bonus if there is only one unit type in the battle, whereas H2 requires at least two aligned unit types (even if one is an upgrade) to get the morale bonus for all being the same town. By the way I know this has been mentioned before, but there is no such thing as "IIX" in roman numerals. It should be "VIII". Mods, is this possible to change? I wrote about it in the "User Ranks and Groups" thread, but it hasn't been changed. Also the "titel" is written as "Grand Druid" instead of "Greater Druid". Well, just because it wasn't changed then, doesn't mean that it can't be changed now. Mods? Subject: Re: "WAIT" in HoMM2: Yes or No?